A pair of Victorian style door knobs with "beehive" design in nickel plated brass. These classic solid brass beehive door knobs have been coated in nickel with matching rose plates and fixing screws. This design was extremely popular during the Victorian (c. 1837 - 1901) period and continues to be popular in today's contemporary homes as well as period renovations. 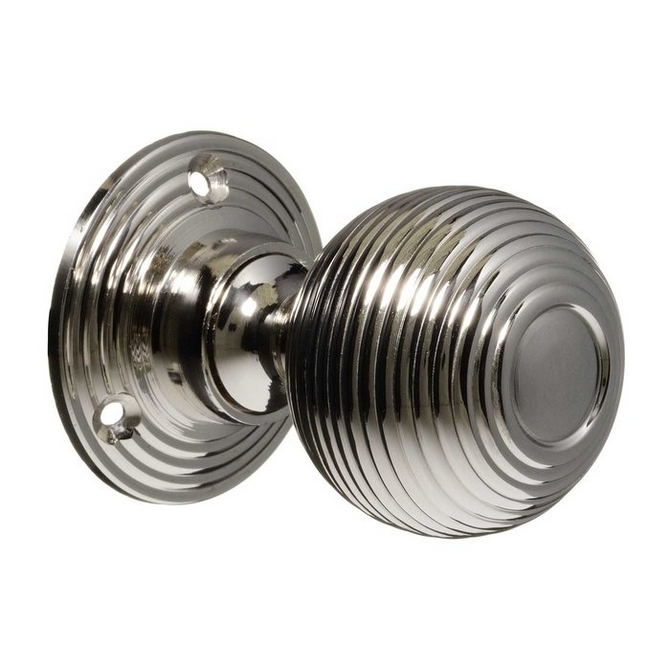 These door knobs show an understated, but classic elegance from a period when quality was not compromised. All our door knobs can be used on either mortise or rim locks as each rose plate is separate. Solid brass nickel plated handles hand turned and aged. Each set comes complete in its own box with door knobs, steel spindle, all fixing screws, hex head steel grub screw and individual Allen key for fitting grub screws.